By Terry Rowley, Joint Editor of The Robins' Review, with thanks to Bill Coop. A personal favourite of the editors of the Robins' Review, Andy was the classic "all action" old style centre-forward. He started out with Bootle and had spells with South Liverpool, Binche (Belgium), Macclesfield, Morecambe and Knowsley before arriving at Moss Lane towards the end of the 93/94 season. Committed hardly begins to describe his style of play, which always rode the fine line between full blown dedication and 'over the top' He became notorious amongst referees resulting in 4 periods of suspension in season 94-95 (and he still managed to score 24 goals!). He was sent off against Dover after arriving on the pitch 9 minutes earlier and this having returned from a previous suspension just 7 days earlier! In the return fixture, he netted a hat trick and this nicely shows the two sides to his character. Despite this 'dark side' his strike rate was as good as any forward in the Conference, for he was more than just 'physical', possessing an extremely high level of skill which was overlooked by many. 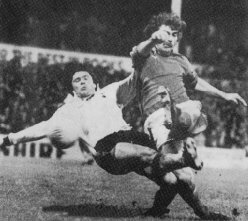 The FA Cup match against Spurs was a highlight and the duel with Gary Mabbutt was one to savour. He left Moss Lane during the 1995/96 season for Barrow and eventually moved to Droylsden. In December 2001 he moved on to play for Rhyl. Manchester born Jeff arrived at Moss Lane from Hyde United in late 1976 as an out and out striker. A modest and quiet man he had started his career at Dukinfield Town and apart from a short spell at Stockport County had served Hyde well as a free scoring centre forward. He marked his Alty debut by scoring (at Moss Lane verses Gainsborough Trinity) and never looked back. In his first two full seasons at Moss Lane Johnson continued in his striker's role (delivering 35 and 30 goals respectively) but it was his conversion to midfield that really established him as a top class player not only at club level but also at International level. Maybe he was not the most skilful player to pull on an Altrincham shirt but no-one has ever tried harder. His style was 100% whole hearted, commitment every time he ran on the field, no game was lost until the final whistle blew, and he knew no other way to play. His style of play complemented the Altrincham side of the late 70s and early 80s and in return it brought him just about every honour possible in the non-league game, playing in three Wembley finals, two (back to back) Alliance Premier League titles (including the league and cup double). He made his International debut in 1981 and went on to win 18 caps. Ironically it was a serious leg injury picked up in his last international appearance in 1986 that effectively finished his regular playing career. Even so he was still to make sporadic appearances for Altrincham over the next couple of seasons either in defence or midfield and was still able to give many of his team-mates a lesson in commitment. 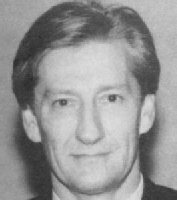 As his playing career wound down he moved into the management side of things becoming assistant manager to Tommy Docherty, eventually succeeding him as manager for a short spell prior to the return of John King. If an example was needed for what epitomised his approach to the game then this anecdote seems apt. When Bill Coop was ringing round the players from the 1978 Trophy Final for the twentieth anniversary reunion in 1998 he phoned Jeff and his response was, "Put me down for ninety minutes". This is so typical of the man and why he is a legend to so many Alty fans that saw him play. Jeff is pictured above playing against Tottenham Hotspur. Jeff Wealands brought a wealth of league experience to Moss Lane when he joined Altrincham for the 1985/86 season. He also continued a trend of signing ex-Manchester United keepers, following on from Alex Stepney and John Connaughton. Jeff had many highlights in his Altrincham career including being in goal when Altrincham beat Birmingham City, 2-1, at St Andrews (*can anyone remember the young Birmingham keeper that night?). He also won an FA Trophy medal in his first season in the win over Runcorn and was a Cheshire Senior Cup finalist in his second season. He left at the end of the 1986/87 season and joined Barrow before rejoining the 'Robins' during the 1988/89 season. He was the 'bedrock' of the side that came so close to winning the Conference during the 1990/91 season, a side that went 28 games without defeat, with Jeff keeping 19 clean sheets in 55 appearances that season. Jeff came out of retirement twice the following season to help Altrincham out but, at 42, he called it a day and concentrated on his property development company. He also briefly joined the Board at Altrincham following his playing career. He still keeps involved in football by helping to coach the goalkeepers at Bury. * The goalkeeper in question was David Seaman.